The Australian Government's LNG export policy - with no reservation for industry and residential consumers - has resulted in a 250 percent increase in the cost of natural gas since 2014. The resulting $8.60 per gigajoule price for natural gas makes efficient, low emission combined cycle gas turbine (CCGT) power stations like that at Pelican Point, South Australia, quite costly to run compared to a high emission low efficiency (HELE) coal-fired power station. The raucous noise over renewable energy in South Australia and the upsurge in government members spruiking high emission low efficiency (HELE) coal-fired power stations is most likely a deliberate distraction from this fiasco that is the government's "sell-it-all" LNG export policy. Gas flows on the Moomba-to-Sydney gas pipeline has supplied NSW with gas since 1976. However, according to data from the Australian ­Energy Market Operator (AEMO), the flow was reversed in December for the first time as the third of three gas export projects being built at Gladstone powered up. The Australian Energy Market Operator (AEMO) has today announced the launch of the newly established Moomba Gas Supply Hub and two additional trading locations at the Moomba to Adelaide pipeline and the Moomba to Sydney pipeline, which are now open for trading. The Moomba Gas Supply Hub follows the successful introduction of the Wallumbilla Gas Supply Hub (GSH), established in 2014 to enhance the transparency and reliability of gas supply by creating a voluntary market that offers a low-cost, flexible method to buy and sell gas at interconnecting transmission pipelines. The exposure of eastern Australia to LNG export markets will have far reaching implications for domestic gas use. Wholesale prices are likely to increase significantly and some questions remain over availability of commercially recoverable gas from Queensland coal seam gas fields. Higher wholesale gas prices are likely to spill over into electricity markets by increasing fuel costs for peak load open cycle gas turbines. Higher gas prices are already flowing through to large domestic customers, with reports that contracts are being offered well in excess of current netback export parity prices. The price of gas for residential customers in Australia’s five largest cities could increase by more than 50% by 2020. IF nothing changes in Queensland's electricity market, 40 aluminium-producing cells at Boyne Smelter will be closed. That's the message from general manager Joe Rea who says it will result in jobs lost and leave the Boyne Smelter down 45,000 tonnes in aluminium production. The price hike was driven by high electricity demand in response to very hot weather conditions in Queensland. He said on January 18, a new demand record was set at 9,357MW exceeding the previous record of 9,097MW. Gas producers have voiced alarm at Queensland’s move to earmark a small patch of new exploration ground for domestic use, although former federal resources ministers and previously staunch domestic gas reservation opponents Ian Macfarlane and Martin Ferguson have changed their position and now back the move. Queensland Resources Minister Anthony Lynham yesterday announced the release of 58sq km of exploration ground in the onshore Surat Basin with the “strict” condition that any gas produced must be used in Australia. The Queensland Resources Council, which counts both the big gas exporters and some big gas users (such as Incitec Pivot, Rio Tinto and Glencore) among its members and is now run by Mr Macfarlane, applauded the move. The third heatwave in two months has hit salad growers in Queensland's south hard, with many farmers battling to harvest 30 per cent of their crop. Farmer Clem Hodgman said he has been losing about 50,000 lettuces and 25,000 cauliflowers a week at his property near Toowoomba. "The temperatures are so high, crops are burning off in the fields." He said while prices were rising in supermarkets, farmers would not reap the benefit as energy and water costs rose accordingly. "We don't want another summer like this for many, many years," he said. But Rachel Mackenzie from farm lobby group Growcom said the heat could be the new norm. She said an industry study into heat impacts on the salad industry did not predict such high temperatures for another 13 years. "We were looking at 2030 in terms of when some of these thresholds would be reached," she said. "This could be our new reality. We've had three years in a row where we've had significant heat, and we need to start saying what can we do to make sure we have the right [ways] to deal with this."
. @abcnews Burying climate change: news that heatwaves destroy crops in Queensland tucked away with police dog story. What are you up to? The record for hottest February day in Birdsville in the state's far south-west has been broken, with Bureau of Meteorology (BOM) figures showing the mercury in the town hit 46.2 degrees Celsius at 4:10pm. Previously, Birdsville's hottest February day was 45.8C in 2006. The all-time record at Birdsville airport was 49C in January 2013. More temperature records could be broken next week unless a high pressure system over the Tasman Sea arrives to cool things down. The hot weather is the continuation of a low pressure surface trough over southern Queensland that contributed to higher than average temperatures in January. 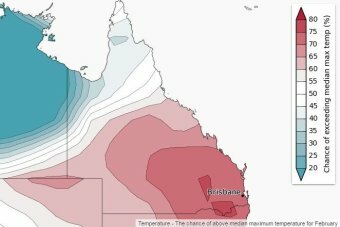 Overnight minimums in January were the highest on record for a large area of southern Queensland, while maximum temperatures were in the highest 10 per cent of historical records for nearly all of the state's southern half. The mercury peaked at 39.1C in Warwick on the Southern Downs yesterday, more than 10C above average. BOM forecaster Vinord Anand said it was the hottest February day in the town since records began more than 50 years ago. "The record before yesterday was 39 degrees, which was in February 1983," he said. Applethorpe hit a scorching 36.8C, more than 11C above average. "The last time it was nearly that hot was in February, also in 1983, when it was 36.1C," Mr Anand said. The all-time maximum record for Applethorpe is 37.8C, while in Warwick it is 41.7C. Mr Anand said it had cooled down slightly in the region today, with Applethorpe reaching 25C by 11:00am. "It's cooler today in those areas compared to yesterday, but we do expect it to warm up again into the weekend and next week," he said.